Dalton Jack was at his construction job in Dubuque, Montana on the night of July 18th, 2018. He was working almost 100 miles away from his home in Brooklyn, Iowa. There, he had a sweetheart who was missing him—anxiously waiting for him to return so they could soon travel to the Dominican Republic to watch Jack’s older brother get married. Her name is Mollie, and Jack is just one of many who love and adore her for being “the sweetest, kindest, most caring person.” Now Jack, along with family and friends, police, and even the FBI, are conducting a furious search to find Mollie Tibbetts in the days following her mysterious disappearance from a rural Iowa farming community. Later that evening of July 18th, around 10 PM, Jack opened a SnapChat message from Mollie. She was at his house, watching his dogs for him while he worked. “It was just a selfie with a caption, and I don’t remember what the caption said,” he said. “It looked like she was inside.” The next afternoon, Jack got a call from Mollie’s coworker, saying that Mollie did not call into work that day and never showed up to work her shift. That’s when Jack noticed that Mollie had not opened any of the messages he’d sent her since he received her snap the night before. Jack began contacting her family and close friends to see if anyone had heard from her. No one had. They called the local hospital, but Mollie wasn’t there either, prompting Jack to make a lengthy drive back to Brooklyn. Misinformation in the media has reported that Mollie was snatched while on a regular evening jog. Jack told authorities that it was unclear what time Mollie’s last snap chat was sent, but it was a few hours before Jack actually opened it—around the time Mollie would have regularly gone out for a jog, as the weather was starting to cool off. “I read somewhere that she was running in a cornfield. That’s obviously not true,” said Mollie’s aunt, Kim Calderwood. “The run happened and then she was at the house as far as we know. I don’t think she would’ve run in the dark,” Calderwood said. The investigation into Mollie’s disappearance has left local law enforcement mystified. Brooklyn, Iowa is a close, friendly farming community, where no one is a stranger to their neighbors. Poweshiek County Sheriff Thomas Kriegel cannot remember anyone in the community ever being missing for this long in the past, but the geography of Brooklyn is making the search difficult. “We’re surrounded by farm ground — corn and soy beans. Right now, the corn is probably eight, nine feet tall. The only way you can search it is basically walk down every other row,” he said. “It’s difficult. Even the planes flying over have a difficulty looking down in the corn rows.” The police at this time have named no suspects, having cleared Dalton Jack after validating his alibi in Dubuque. They have not yet ruled out abduction. They hope to utilize the data from Mollie’s cell phone and her fitness tracker to answer some questions about what happened that night. 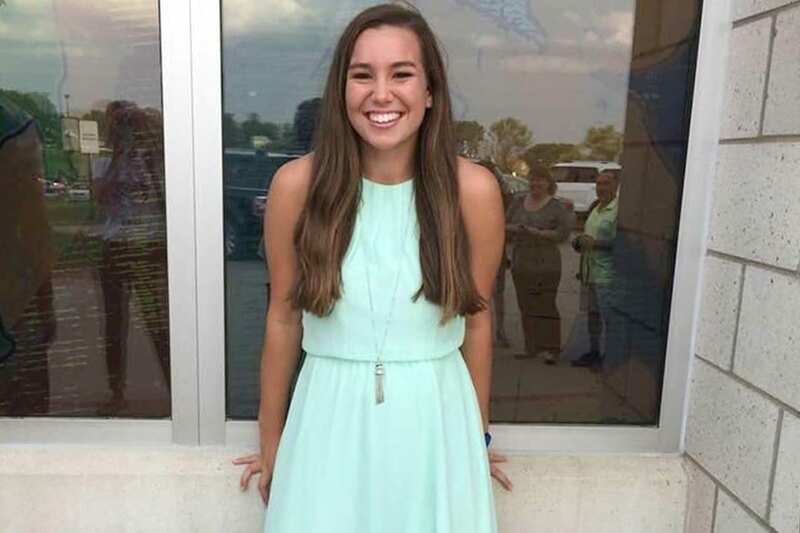 According to the New York Post, “Iowa Division of Criminal Investigation spokesman Mitch Mortvedt said Wednesday that investigators believe they’ve ‘put together a pretty solid timeline’ of what 20-year-old Mollie Tibbetts was doing before she was last seen jogging in her hometown of Brooklyn, Iowa.” The article goes on to say investigators only wish they could comb the information faster in the interest of finding Mollie. In just a week, the search party has ballooned from dozens to hundreds, with the FBI recently joining the effort. 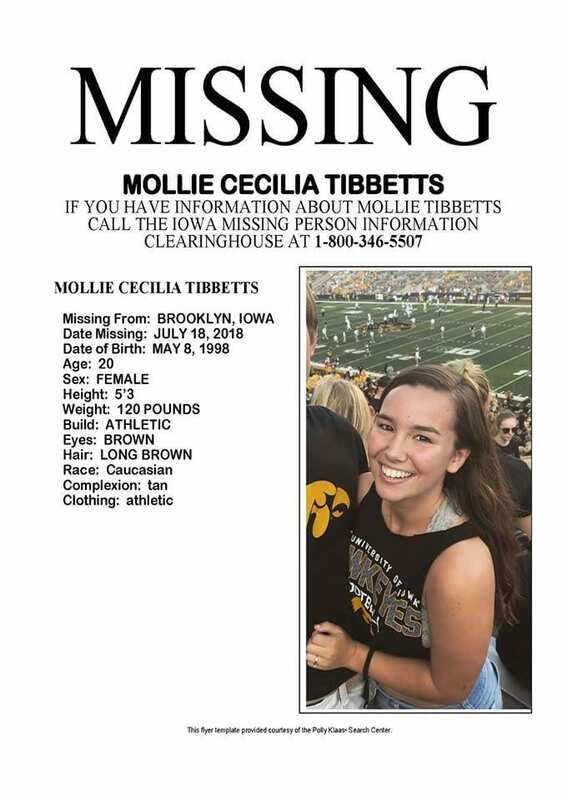 In the first days of her disappearance, friends and family tweeted to celebrities with Iowan roots who might use their fame to spread Mollie’s face and name across the country, in the hopes that someone has seen her. Celebrities who participated in this effort, including Adam Devine, Brandon Routh, American Idol winner Maddie Poppe, Kurt Warner, and comedian Tom Arnold. Carie McMichael is the Communications and Media Specialist for Lauth Investigations International, writing about investigative topics such as missing persons and corporate investigations. For more information on missing persons topics, please visit our website.